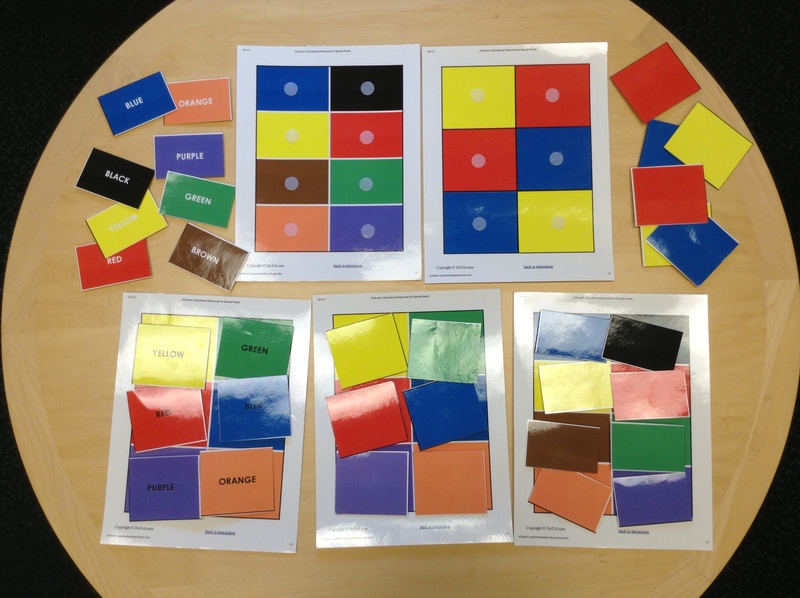 These tools are available to help teach specific academic lessons. Find what you need or get ideas! Thinkables & Unthinkables Double Deck by Think Social Publishing Inc. 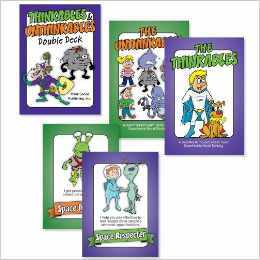 The Thinkables & Unthinkables Double Deck is the superflexible teaching tool you asked for to use with individuals who are learning about or have already been introduced to Superflex, the 14 original Unthinkables, and the newer characters, the Thinkables. 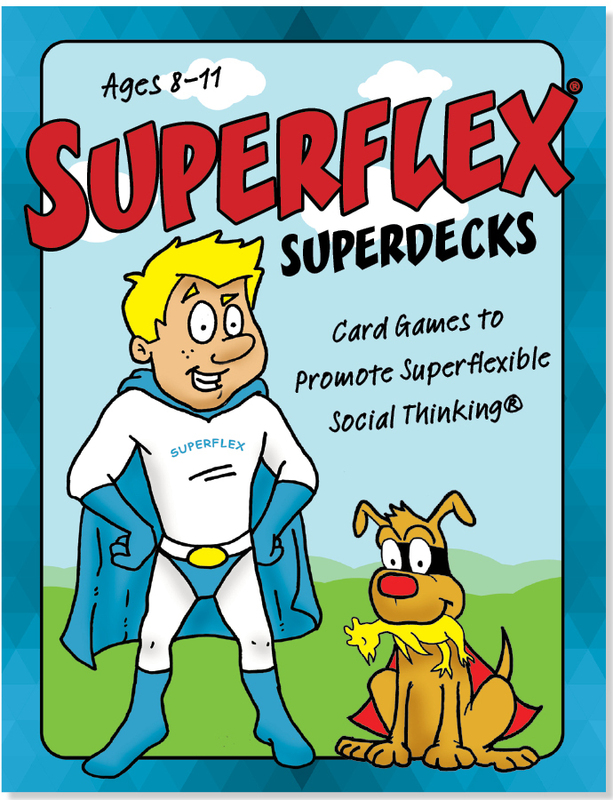 You take the lead in using the cards — they’re a blank canvas of possibilities! The Survival Guide for Kids with Autism Spectrum Disorders (And Their Parents) by Elizabeth Verdick and Elizabeth Reeve M.D. This positive, straightforward book offers kids with autism spectrum disorders (ASDs) their own comprehensive resource for both understanding their condition and finding tools to cope with the challenges they face every day. Some children with ASDs are gifted; others struggle academically. Some are more introverted, while others try to be social. Some get “stuck” on things, have limited interests, or experience repeated motor movements like flapping or pacing (“stims”). The Survival Guide for Kids with Autism Spectrum Disorders covers all of these areas, with an emphasis on helping children gain new self-understanding and self-acceptance. 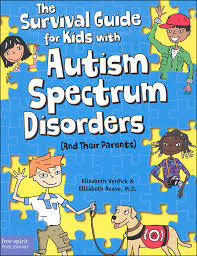 Meant to be read with a parent, the book addresses questions (“What’s an ASD?” “Why me?”) and provides strategies for communicating, making and keeping friends, and succeeding in school. Body and brain basics highlight symptom management, exercise, diet, hygiene, relaxation, sleep, and toileting. Emphasis is placed on helping kids handle intense emotions and behaviors and get support from family and their team of helpers when needed. The book includes stories from real kids, fact boxes, helpful checklists, resources, and a glossary. Sections for parents offer more detailed information. 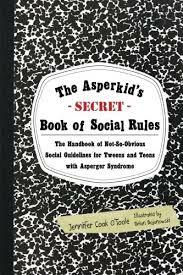 The Asperkid’s Secret Book of Social Rules: The Handbook of Not-so-obvious Social Guidelines for Tweens and Teens With Asperger Syndrome by Jennifer Cooke O’Toole. Being a teen or tween isn’t easy for anyone — but it’s especially tough for Asperkids. I know. I was one, I taught a whole bunch, and I am going to be raising three! That’s also why I know that Asperkdis deserve their very own guide to all of the hidden social rules that are awfully confusing to us, even if they seem obvious to everyone else. “The Asperkids’ (Secret) Rule Book of Social Rules.” This isn’t your momma’s Emily Post, and there is no “don’t do this” finger-wagging or patronizing “high and mighty preaching” here. Instead, the “Secret” Book gives Asperkids (aged 10-17) respectful, funny insights written “for Aspies by an Aspie.” Chock full of illustrations, logic and even a practice session or six (in comic strip style, thank you very much! ), this is the handbook every adult Aspie wishes we’d had growing up, but never did. 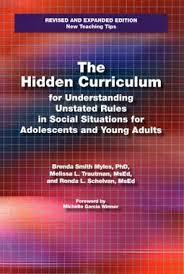 The Hidden Curriculum: Practical Solutions for Understanding Unstated Rules in Social Situations by Brenda Myles, Melissa Trautman, and Rhonda Schelvan. In the revised and expanded edition of this popular book, the authors narrow their target to issues common to adolescents and young adults. While many of the features of the original book have been maintained, information on evidence-based practice has been added. Further, a series of instructional strategies are provided that can be used to teach the hidden curriculum. Instructional aids include charts, forms, and templates designed to make the job of teaching and learning the hidden curriculum more effective. Kit includes two sets of color coded laces and an instructional book. Instructions for using both the Rabbit and Fox method and the Bunny Ears method of tying laces are described. Imagery script for the former is also available. Material from Little Friends, Inc. http://littlefriendsinc.org/. Using visual representations of emotions, this book has children match the expression they see on the face on a card to the word for that emotion. 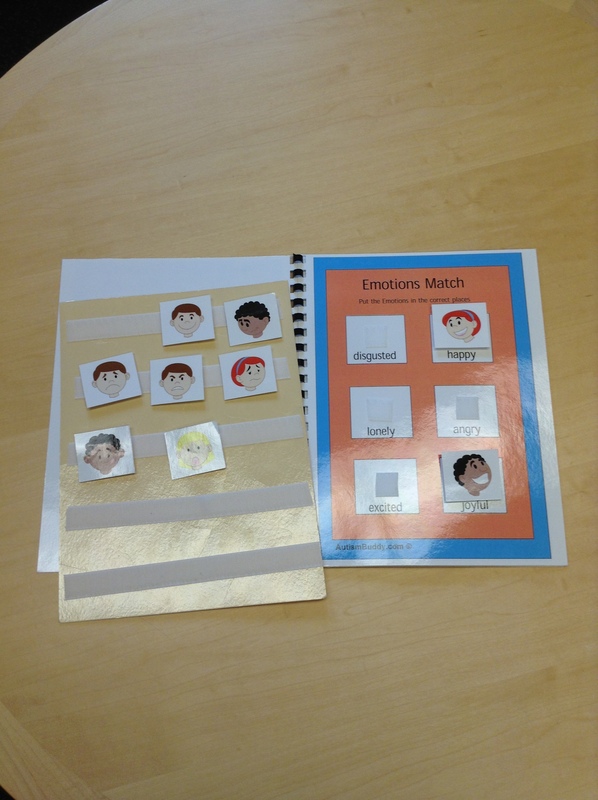 Kit comes with cards of cartoon faces expressing different emotions and velcro spots with labeled emotions to which a student matches them. 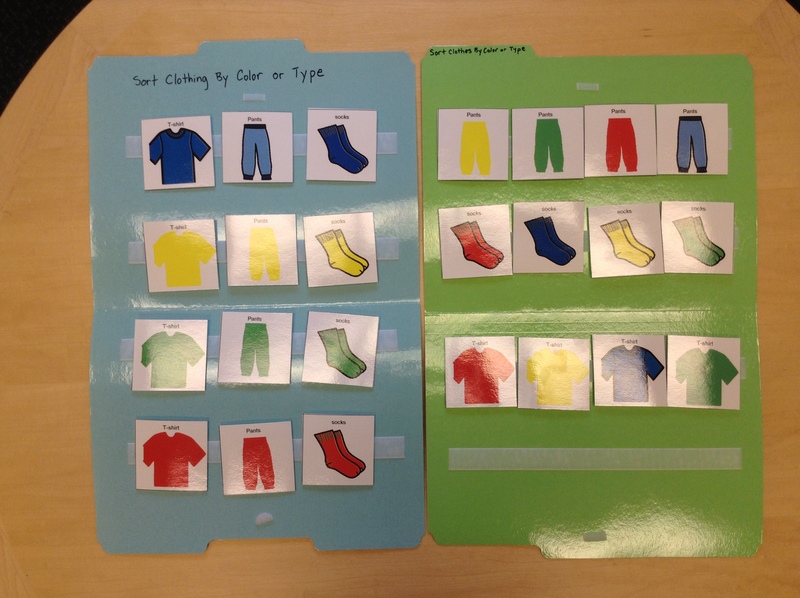 This learning aid focuses on categorizing clothing type and color. This kit’s objectives include color comprehension, as well as ability to understand patterns. The kit includes two folders with matching Velcro pieces to sort. The focus of this kit is to teach various colors and their spelling. This learning aid includes 5 cards and matching Velcro color pieces, some with written words and some with color blocks. This learning aid focuses on subtraction, calculation and comparison of money. 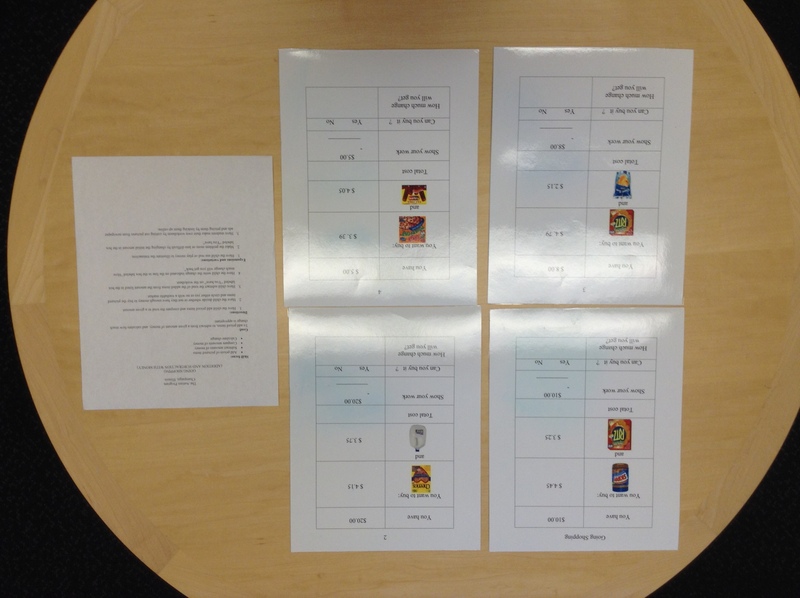 The goal is to subtract a priced item from a given amount of money and decide how much change is appropriate. This kit includes four worksheets and instructions. 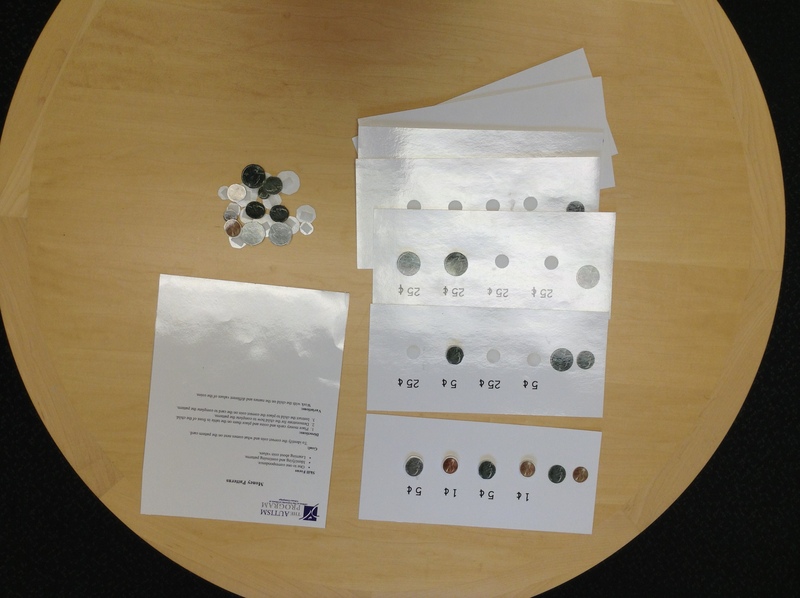 This learning aid focuses on addition and subtraction through the use of money and coins. The goal of this learning aid is to add items, subtract a given amount of money, and calculate how much change is appropriate. This kit includes four laminated worksheets and instructions. 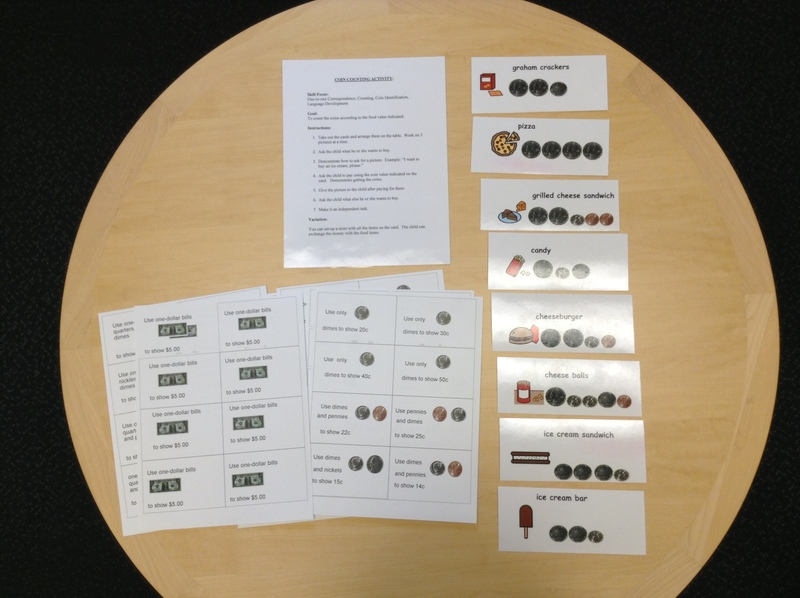 The focus of this learning aid is to identify patterns and learn about coin values. The goal is to identify the correct coin and what comes next on the pattern card. This kit includes patterned coin cards, Velcro coin pieces and instructions. 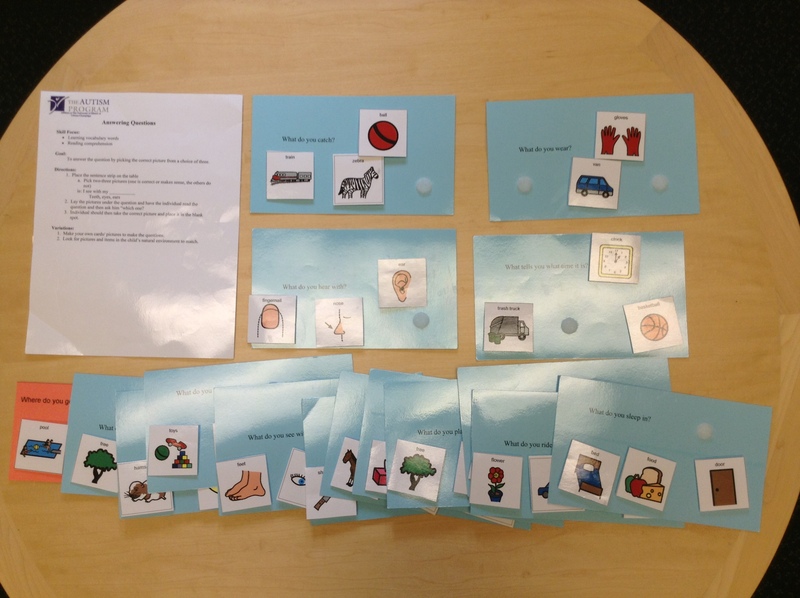 This learning aid focuses on coin identification, counting and language development. The goal is to count the coins according to the food value indicated. 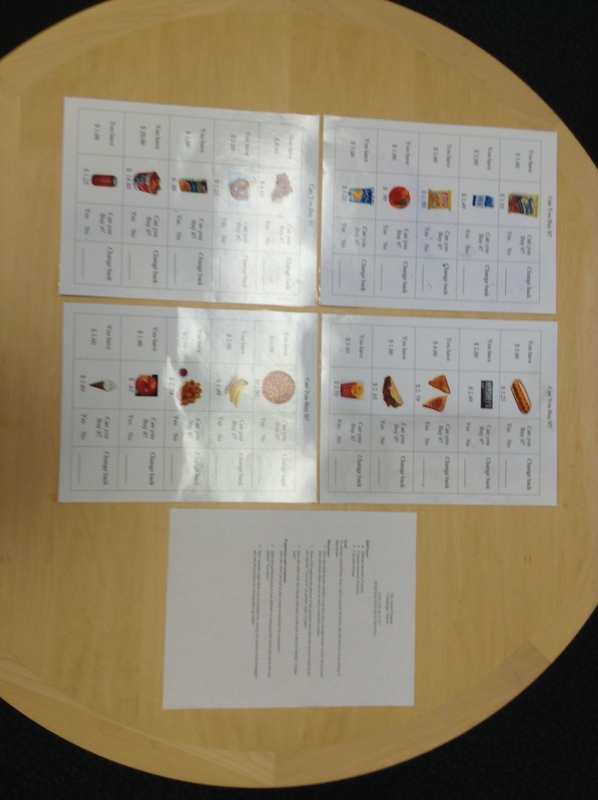 This kit includes dollar and coin cards, food cards, and instructions. This learning aid focuses on completing a sentence. The skill objectives for this learning aid are sentence completion, learning vocabulary words, and reading comprehension. 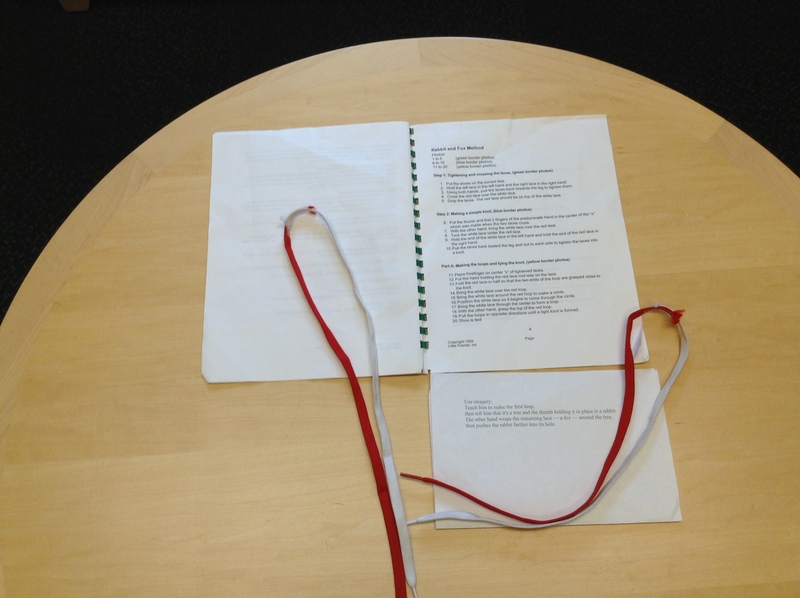 This kit includes sentence cards, matching Velcro pieces and a set of instructions. The skill focus of this learning aid is to enhance reading comprehension while teaching vocabulary words. The questions on the cards are answered by picking the correct picture from a choice of three. 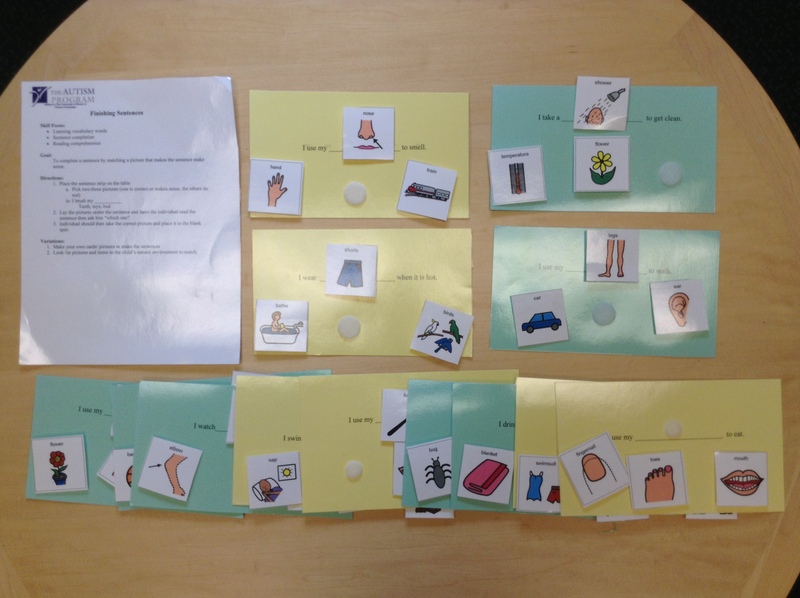 This kit includes question cards, Velcro answer pieces, and a set of instructions. 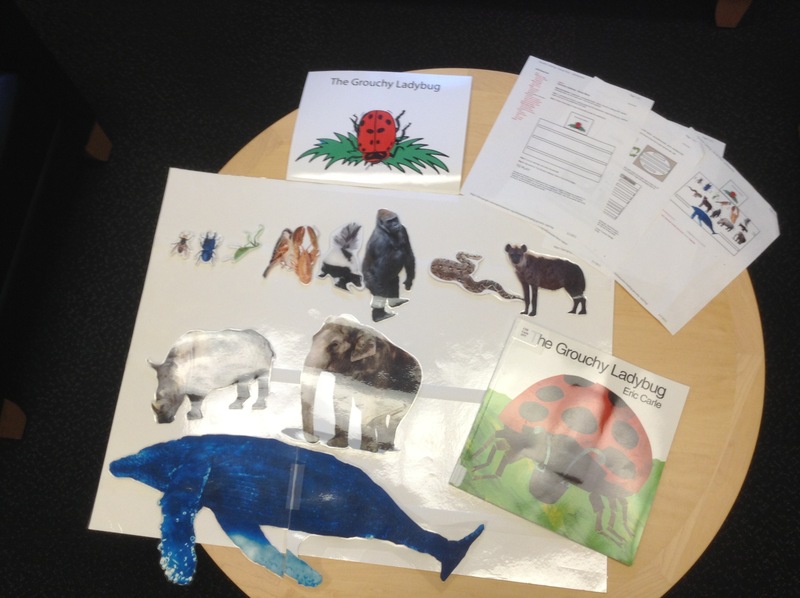 The focus of this learning aid is to encourage students to take turns placing animals from the story onto the poster as the class reads along from the book. This kit includes The Grouchy Ladybug written by Eric Carle and a large poster with matching Velcro images from the story.